Pennsauken, NJ – January 19, 2010 – Prior to April 1975, people around the world knew about the Vietnam War. Today, people know about the fertile land of the Mekong Delta that helps Vietnam to be ranked as the second leading exporter of rice in the world. However, there are very few people who know the true history of the Mekong Delta and its surrounding regions. Therefore, people don’t know about the indigenous Khmer-Krom peoples. The Khmer-Krom are the indigenous peoples of Kampuchea-Krom. Kampuchea-Krom means “Cambodia Below” or “South Cambodia”. Kampuchea-Krom was the southernmost territory of the Khmer Empire. The territory was renamed Cochinchina during the French colonization of Indochina. After the French government illegally transferred its colony, Cochinchina, to Vietnam on June 4, 1949, without the plebiscite or the consent of the Khmer-Krom, Cochinchina (Kampuchea-Krom) became lower half of the Republic of South Vietnam. Since April 30, 1975, Kampuchea-Krom has been known as the Southern part of the Socialist Republic of Vietnam. Living under the control of the Vietnamese government, the indigenous Khmer-Krom peoples have suffered tremendous human rights violations, confiscation of ancestral lands, and economic and social deprivations. The Indigenous Khmer-Krom peoples are not allowed to learn their own language and history in public schools or to freely practice their Theravada Buddhism without the interference of the Vietnamese government. 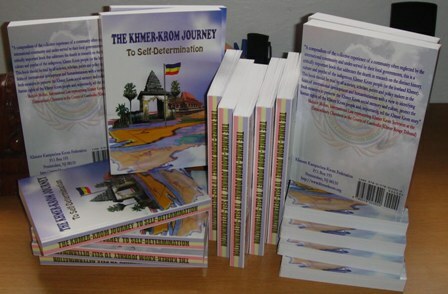 As an effort to bring awareness of the voiceless Khmer-Krom in Kampuchea-Krom to the world, the Khmers Kampuchea-Krom Federation (KKF) is proud to present this book about the Khmer-Krom, entitled “The Khmer-Krom Journey to Self-Determination”. This is the first time this subject has been presented in this level of detail in the English language. This book contains material produced by the KKF reflecting the true accounts of the Khmer-Krom regarding their history, culture, religion, and land. This information was produce by the combined efforts of KKF contributors, living in Kampuchea-Krom and from countries around the world. This book also consists of a collection of articles and essays about the Khmer-Krom that are written by academics and Human Rights advocates.